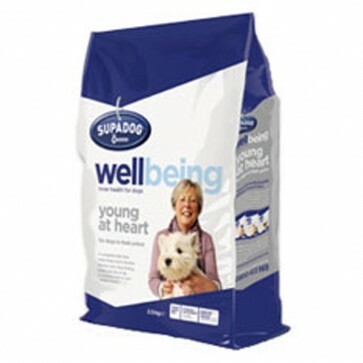 Burgess Supa Dog Wellbeing Young At Heart; is a Nutritionally Complete Adult Dog Food, specially formulated to help mature dogs stay in shape. It's made with a blend of High Quality Chicken & Fish Protein that is Combined with Rice to Aid Digestion. Young At Heart is Wheat Gluten Free and Enriched with B Vitamins, Biotin and Long Chain Polyunsaturated Omega 3 Fatty Acids for Healthier Paws, Skin & Coat, particularly the surface of the pad. Glucosamine & Herbs are also included to help working joints, as well as Linseed & Zinc to promote a Strong and Shiny Coat. Wellbeing Young At Heart also contains Mannan Oligosaccharide to Remove Bad Bacteria and a Prebiotic to maintain Healthy Gut Flora.